The growth in the American Pizza market in 1986 was what initially grabbed the attention of founders Emily Gore Grimes and her husband Robert Pendelton, co-founders of Apache Pizza. By 1995, pizza was still the number one growth sector in the fast food industry. This decade of sustained growth in the USA showed that they had only realised the tip of the iceberg in the Irish market and that there was huge potential for growth. The company recognised a service gap in the market for an Irish pizza delivery brand. 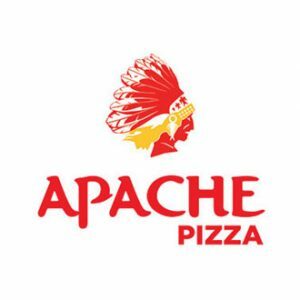 Apache Pizza was launched in Dublin in 1996, the name was chosen to reflect that their pizzas are based on the American style as opposed to the original Italian style pizzas which have a different dough base. Apache pizza was also named in the spirit and admiration and respect for the indigenous peoples of North and South America. Apache by definition, is a collective term for several culturally related groups of Native tribes who stood up against oppression under the incredible Geronimo. Since 1996, Apache Pizza have opened over 160 outlets around the country. They are committed to developing and expanding Apache Pizza in order to become the biggest and best pizza retail and delivery operator in Ireland. The market for delivered/take-away fast food is progressing from the traditional ‘dep fried’ high fat content foods towards fast food which constitutes a more balanced nutritional offering to an increasingly discerning consumer. Apache Pizza are now leading the way working with Health Pro and providing nutritional values and portion advice not only available on www.apache.ie but also printed on all menus and available in-store. Apache is Ireland’s largest pizza chain. In 2014, Fox News listed Apache as one of the best pizza chains in the world. Just Eat named Apache as Ireland’s best takeaway in 2015.